Nantucket is an island about 30mi by ferry south from Cape Cod, in the American state of Massachusetts. Popular historic sites such as Sankaty Head Lighthouse and Brant Point Lighthouse are in your itinerary. Explore hidden gems such as Whaling Museum and Great Point Light. There's much more to do: appreciate the extensive heritage of Milestone Bog, pause for some serene contemplation at St Paul's Episcopal Church, examine the collection at Nantucket Lightship Basket Museum, and steep yourself in history at Greater Light. For other places to visit, where to stay, traveler tips, and tourist information, go to the Nantucket day trip planning site . London, UK to Nantucket is an approximately 11.5-hour flight. You can also do a combination of train and flight. Due to the time zone difference, you'll gain 5 hours traveling from London to Nantucket. Expect a bit warmer evenings in Nantucket when traveling from London in September, with lows around 17°C. Wrap up your sightseeing on the 22nd (Sun) early enough to travel to Savannah. 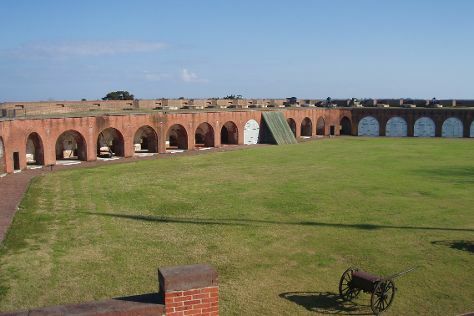 Kick off your visit on the 23rd (Mon): get to know the fascinating history of Fort Pulaski National Monument, stroll the grounds of Bonaventure Cemetery, then stroll through Forsyth Park, and finally see majestic marine mammals with a dolphin and whale watching tour. Get ready for a full day of sightseeing on the next day: explore the different monuments and memorials at Colonial Park Cemetery, contemplate the long history of Owens-Thomas House & Slave Quarters, then contemplate the long history of Olde Pink House, and finally see the interesting displays at Tybee Island Lighthouse Museum. To see reviews, other places to visit, and tourist information, read our Savannah holiday site . Getting from Nantucket to Savannah by flight takes about 6.5 hours. Other options: do a combination of ferry and flight; or do a combination of ferry, bus, and train. Plan for a bit warmer temperatures traveling from Nantucket in September, with highs in Savannah at 34°C and lows at 24°C. Wrap up your sightseeing on the 24th (Tue) to allow time to travel to Branson. Start off your visit on the 25th (Wed): take in nature's colorful creations at Bonniebrook Park, then identify plant and animal life at Dogwood Canyon Nature Park, and then contemplate in the serene atmosphere at Thorncrown Chapel. Get ready for a full day of sightseeing on the 26th (Thu): identify plant and animal life at Shepherd of the Hills Fish Hatchery, contemplate the waterfront views at Table Rock Lake, and then see the interesting displays at Titanic Museum. For more things to do, ratings, where to stay, and tourist information, you can read our Branson online tour planner . You can fly from Savannah to Branson in 6.5 hours. Other options are to do a combination of flight and car; or drive. Traveling from Savannah to Branson, you'll gain 1 hour due to the time zone difference. Traveling from Savannah in September, Branson is a bit cooler at night with lows of 18°C. Cap off your sightseeing on the 26th (Thu) early enough to travel to Santa Fe. Kick off your visit on the 27th (Fri): pause for some serene contemplation at The Cathedral Basilica of St. Francis of Assisi, wander the streets of Canyon Road, then see the interesting displays at Museum of International Folk Art, then don't miss a visit to Santa Fe Plaza, and finally explore the world behind art at Georgia O'Keeffe Museum. Keep things going the next day: shop like a local with Tesuque Glass Works, take in the spiritual surroundings of Loretto Chapel, then explore the world behind art at San Miguel Chapel, and finally wander the streets of Barrio de Analco. To find photos, where to stay, maps, and tourist information, read our Santa Fe online trip itinerary builder . Traveling by flight from Branson to Santa Fe takes 6 hours. Alternatively, you can do a combination of flight and shuttle; or drive. The time zone difference moving from Central Standard Time (CST) to Mountain Standard Time (MST) is minus 1 hour. Traveling from Branson in September, Santa Fe is slightly colder at night with lows of 13°C. Finish up your sightseeing early on the 28th (Sat) so you can travel to Kailua-Kona. Kick off your visit on the 29th (Sun): get up close to creatures of the deep with a dolphin and whale watching tour and then discover the deep blue sea with a scuba or snorkeling tour. On the 30th (Mon), you'll have a packed day of sightseeing: get interesting insight from Tours and then cast your line with a fishing tour. For reviews, other places to visit, photos, and other tourist information, refer to the Kailua-Kona trip tool . Do a combination of shuttle and flight from Santa Fe to Kailua-Kona in 11.5 hours. Alternatively, you can fly. Traveling from Santa Fe to Kailua-Kona, you'll gain 3 hours due to the time zone difference. When traveling from Santa Fe in September, plan for somewhat warmer days and warmer nights in Kailua-Kona: temperatures range from 36°C by day to 28°C at night. Finish your sightseeing early on the 30th (Mon) so you can travel to Lahaina. Start off your visit on the 1st (Tue): see some colorful creatures with a scuba or snorkeling tour and then take a tour by water with Boat Tours & Water Sports. On your second day here, take in the spiritual surroundings of Calvary Chapel Westside, make a trip to Lahaina Banyan Court, then take a stroll through Lahaina Front Street, and finally whizz through the canopy at some of the top local zipline courses and adventure parks. For maps, reviews, photos, and other tourist information, refer to the Lahaina trip itinerary maker website . You can fly from Kailua-Kona to Lahaina in 4 hours. Alternatively, you can do a combination of flight and bus; or do a combination of bus and flight. In September in Lahaina, expect temperatures between 35°C during the day and 27°C at night. Cap off your sightseeing on the 2nd (Wed) early enough to travel to Honolulu. Kick off your visit on the 3rd (Thu): contemplate the long history of Iolani Palace, then identify plant and animal life at Wildlife Areas, and then take in the architecture and atmosphere at St. Rita's Catholic Church. Get ready for a full day of sightseeing on the next day: explore the different monuments and memorials at National Memorial Cemetery of the Pacific, then examine the collection at USS Bowfin Submarine Museum & Park, and then make a trip to Battleship Missouri Memorial. For photos, other places to visit, ratings, and more tourist information, you can read our Honolulu trip maker tool . Traveling by flight from Lahaina to Honolulu takes 3.5 hours. Alternatively, you can do a combination of ferry and flight; or do a combination of bus and flight. Expect a daytime high around 36°C in October, and nighttime lows around 27°C. Wrap up your sightseeing on the 4th (Fri) to allow time to travel back home.